Yes, the global economy is facing a dangerous cocktail of risks. But there is room for optimism too. Slowing China, rising U.S. interest rates, crashing commodity prices, and jittery emerging markets could all tip the world into a painful economic chaos. But leaders at the World Economic Forum in Davos say that if handled properly, these scary events could actually bring the world back to normality. The global economy is in much better shape than it was before the last recession. Many emerging markets, which are still driving the global growth, have cut down on their foreign debts, so they are better insulated against the rising interest rates in the U.S. The financial system is also stronger. "We used to have huge balance sheets, we were highly leveraged, there was excessive animal spirit, now we can go through stress," Tidjane Thiam, the chief executive of Credit Suisse (CSGKF), said in Davos. While disastrous for some, tumbling prices of oil and other commodities support growth in India, China, and Europe. Consumers cheer the low prices too, which boosts consumer demand. That means the global middle class is growing, which is also a good sign for the economy. A slower China, up high on the list of risks, also means a more sustainable China. "China is slowing down in a controlled fashion, and that's a positive thing," Christine Lagarde, the head of International Monetary Fund, said at the forum. Still, markets are freaking out about China -- the first three weeks of 2016 have been the Wall Street's worst start of the year ever. But Lagarde thinks that a little more clarity from China could solve the problem -- investors are worried mainly because they don't know what China is up to, fearing they can't trust the official numbers. China should learn a lesson or two from the Fed. Its decision to raise interest rates in December, the first hike in over a decade, surprised no one and left the markets calm. The Fed started raising interest rates just as the European Central Bank hinted at more stimulus. They are pulling in opposite directions, but that too could be a good thing for the global economy. "If the Fed, Bank of England, the ECB, and Japan...all started to exit from monetary easing at the same time, the impact could be worse than the current staggered approach," said Haruhiko Kuroda, the Governor of the Bank of Japan. The geopolitics will remain the most worrisome part. Tensions in the Middle East are growing and the conflict in Ukraine seems to have stalled. The terror threat is once again on everyone's mind, following deadly attacks in Paris, Lebanon, Egypt and elsewhere. 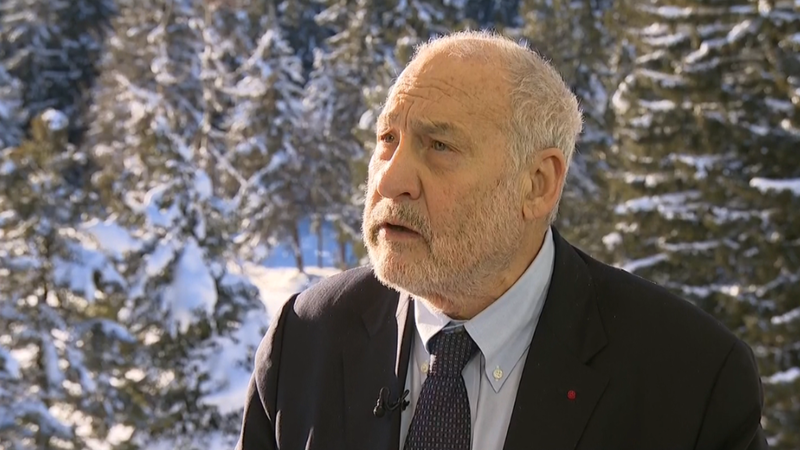 The message from this year's Davos meeting is to be optimistic, but stay cautious. The risks are still huge and there is very little room for mistakes. Europe is at a breaking point, grappling with the world's worst refugee crisis in 70 years and the prospect of Britain deciding to break away. Politicians are fast running out of time to save the European project. With low or even negative interest rates in most developed countries, the world is still hooked on cheap money and politicians need to up their game in terms of structural reforms.